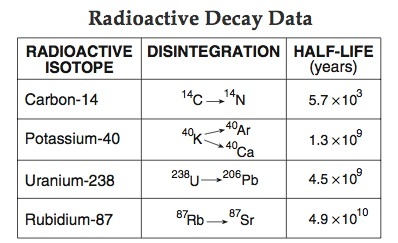 As we learned yesterday radioactive elements decay at characteristic or constant rates. THE RATE AT WHICH THEY DECAY IS MEASURED IN HALF LIVES. HALF LIFE IS THE AMOUNT OF TIME IT TAKES FOR ONE HALF OF THE RADIOACTIVE MATERIAL TO DECAY INTO A STABLE FORM. We use several radioactive isotopes to find the absolute age of events and objects because we know their half life. On the cover of your ESRT in the top left box you will find the Radioactive Decay Data for four isotopes which we will focus on. Carbon 14 occurs naturally, and is absorbed by all living things when we eat and drink. When we die, we no longer ingest C14, and it begins to decay and turn into N14. By comparing the amount of C14 in an object to the amount of N14 in it we can determine how long it has been decaying for, and therefore when the organism died. Potassium 40, is the most common of the radioactive isotopes. It can be found in all types of rocks but WE WILL ONLY USE IT TO FIND THE AGE OF SEDIMENTARY ROCKS!!! Uranium 238 has a half-life of 4.5 billion years! Through decay Uranium-238 turns into stable Lead-206. Because its half-life is so long it is useful for dating the oldest rocks on Earth, but not very reliable for rocks under 10 million years old. 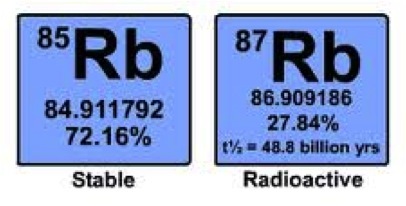 Rubidium 87 has a half life of 49 billion years! This is ten times the age of the Earth, so very little Rubidium has decayed at all. For this reason WE WILL NEVER CHOSE TO USE THIS ISOTOPE! How do we Use Radioactive Isotopes to find the Absolute Age of Objects? Finding the age of an object using radiometric dating is a four step process. As long as you follow these four steps you will always be able to accurately determine the age of a rock or fossil. Step 1: How many half-lives have gone by? The first thing we want to know to find the age of an object is to figure out how many half-lives have passed. To do this we need to know the amount of radioactive material remaining in the object. Example: A skeleton is found to contain 1/8th of its original radioactive material. How many have lives have gone by? So our skeleton has existed for 3 half lives. Step 2: Which isotope do we use? Since skeletons used to be living things we must use C-14 as our isotope. Now we know that we're using C-14, and its been through 3 half-lives. Step 3: How long is each half life? In the last step we determined we had to use C-14, so we just need to look at the ESRT to find that each half-life of C-14 is 5,700 years. Step 4: Multiply the Number of Half-lives by the length of each half-life. 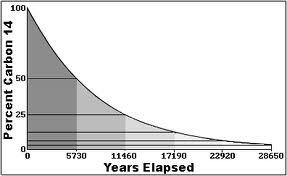 To finally find the age of the skeleton we just multiply 3 half-lives by 5,700 years each half-life to discover that the skeleton is 17,100 years old!